The Karosserie vision is to create an extremely high quality collision repair and restoration facility for European cars was eagerly received upon our opening in 1973. Recognized as one of the nation’s premier Ferrari and exotic repair facilities, Karosserie has remained dedicated to the original vision, quietly developing its collision service to equal standards and stature. Nationally recognized for its superior craftsmanship in metal work and paint finishes, Karosserie has built an impeccable reputation for collision reconstruction. Offering the best in factory trained technicians, factory certified equipment, and authentic OEM parts allowing for the proper reconstruction essential for maintaining integrity and value. Our spacious facility for repairing European coachwork is extensively equipped with the most advanced frame, sheet metal and paint technology. Metal repairs are performed on one of seven frame benches while utilizing modern welding techniques and equipment. Our paint department includes preparation and priming booths, climate controlled spraying and baking booths, mixing rooms equipped with the latest computer information for matching the original color finish, and rooms devoted to the final polishing of every vehicle. Whether it is your exotic car or your daily luxury vehicle, Karosserie has proven time and again its ability and versatility in renewing your vehicle to its original specifications and beauty. The Karosserie vision is to create an extremely high quality collision repair and restoration facility for European cars was eagerly received upon our opening in 1973. 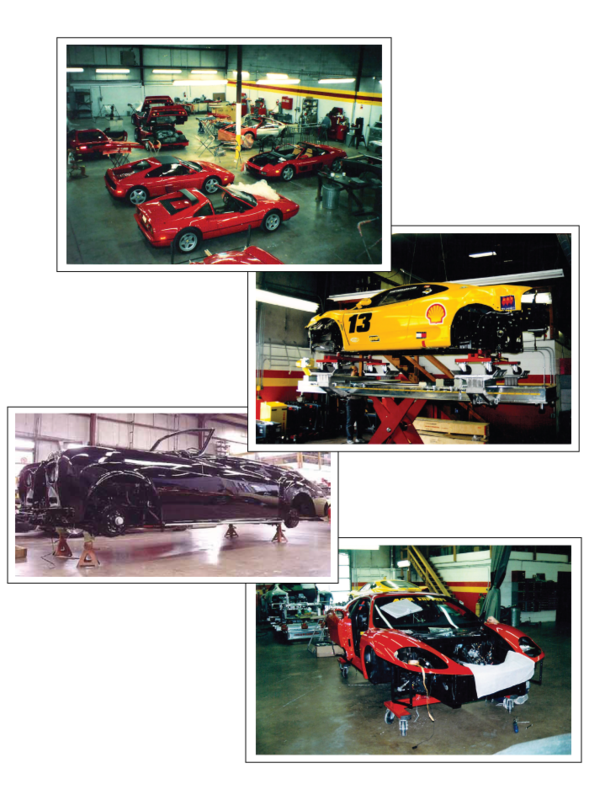 Recognized as one of the nation’s premier Ferrari and exotic repair facilities, Karosserie has remained dedicated to the original vision, quietly developing its collision service to equal standards and stature. Nationally recognized for its superior craftsmanship in metal work and paint finishes, Karosserie has built an impeccable reputation for collision reconstruction. Offering the best in factory trained technicians, factory certified equipment, and authentic OEM parts allowing for the proper reconstruction essential for maintaining integrity and value. Our spacious facility for repairing European coachwork is extensively equipped with the most advanced frame, sheet metal and paint technology. Metal repairs are performed on one of seven frame benches while utilizing modern welding techniques and equipment. Our paint department includes preparation and priming booths, climate controlled spraying and baking booths, mixing rooms equipped with the latest computer information for matching the original color finish, and rooms devoted to the final polishing of every vehicle. Whether it is your exotic car or your daily luxury vehicle, Karosserie has proven time and again its ability and versatility in renewing your vehicle to its original specifications and beauty. Forty four years ago Karosserie was founded to share our love of racing with our clients. Our work on the Ferrari marque is what truly separated us from everyone else. Described by Automobile magazine as “expert”, even “miraculous” in our “metal fabrication,” Karosserie’s commitment to authenticity and finishing standards has been a true game changer. Dedicated to tradition, our utilization of the three main classical methods of metal forming; English Wheel, Power Hammer, and Power Shrinker created results praised nationwide. Our heritage that was built on this dedication to the craft and the fine art involved will never change. Given the recognition and respect to quality we have earned on the types of vehicles that we repair, Karosserie serves an elite range of clientele consisting of high-level executives, celebrities, professional athletes, private families, and ultra-high/high net worth individuals. We have built a reputation of trust among this group by understanding that privacy and discretion is paramount. We don’t allow photos in our facility and information is never shared or leaked. We will also work with an individual’s personal staff or representatives on logistics.